Since the ironic font has yet to catch on to the degree that it really should, and it is otherwise difficult to type one thing while meaning another, I tend to make liberal use of quotations marks in my "writing". A recent trip to the Udi's in Stapleton, Denver's newest "neighborhood", provided me with an irresistible opportunity to fill my post with quotation marks. We were there for "dinner", which in my toddler-run household happens no later than five, usually while my lunch is still digesting. Nevertheless, here we were, and my spider-pig-like pastor sense zeroed in on the following words emblazoned on the wall menu: "Al Pastor Tacos". Before I knew it, I was ordering them and they were on my table. Of course I didn't have high expectations for my tacos al pastor, being that I was in a bakery, and even more so because this bakery was in Stapleton. 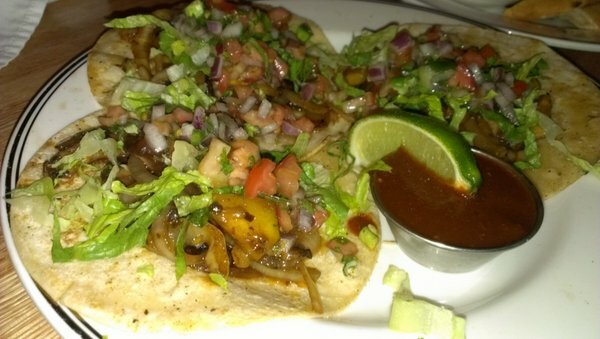 Though there are many worthy tacos within a long home-run of Stapleton's borders, this "urban" community is pretty much the antithesis of raw pork marinated in spices roasting on a spit with an open flame. But I did appreciate that there was no purporting on the part of Udi's about having an "authentic" experience; or certainly no mention of "street tacos", as there is in a certain "taco" shop I just wrote about that is about as far from the "street" as one can get while only being a few feet from it. My tacos were served on what seemed to be a freshly made tortilla. I suppose that should be a given since I was in a bakery, but nevertheless it did not go unnoticed. It was piled high with a good (but unnecessary on tacos al pastor) pico de gallo-like salsa and came with a respectably spicy (something that "street taco" place can't claim) chipotle-heavy "salsa". I poured it over the top and also noticed there were grilled pineapples on the taco as well. Nice touch. I didn't take the time to examine the rest of the contents, as my kids were frantically doing something or other that they probably shouldn't have been doing, and I practically swallowed the first taco. It was tasty and not bad. I didn't get much flavor from the "meat", but the marinade was surprisingly much more "pastor-like" than I would have expected. After my second taco I took a moment to examine the contents: this was not pork. I remember seeing chicken and shrimp as options on the wall menu, but I didn't pick either of those, so whatever could this be? My "taco" it seems, was made of mushrooms. When "reading" the menu initially, I overlooked the actual ingredients, because when I see "tacos al pastor" on a menu, I assume that "pork" is involved. You don't say that you want a meat-product in your hot dog bun when you order a hot dog any more than you would ask for a "pork" taco al pastor. However, upon examining the menu a little closer, I saw that the contents were rather clear: crimini and shitake mushrooms. I "smiled". I never would have ordered this if I knew beforehand it was made of mushrooms, but I'm "glad" I did because, well, I just ate possibly the world's only mushroom taco al pastor. And although I'm pretty sure no vegetarians have made it past my blog's logo, if you are reading this and you don't eat animal flesh, or even if you happen to know someone like that, it might be worth your (or your friend's) while to get over to Udi's and try this freak-show of a "taco". Me? I'll never eat it again--though not because it didn't taste good. 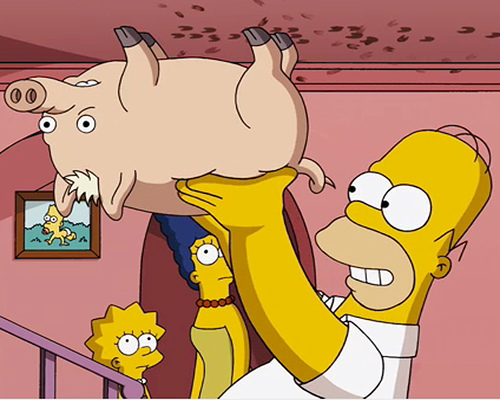 It just felt--and still feels--wrong. Technically I'm not sure a "taco" can be called a "taco" when it was supposed to have pork and didn't. 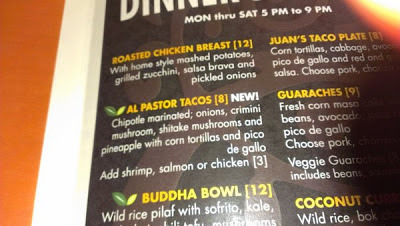 And although some of the flavors were there (and the marinade better than some "real" pastor taquerias), calling it "al pastor" is also a stretch, so let's compromise and add in some extra quotation marks. 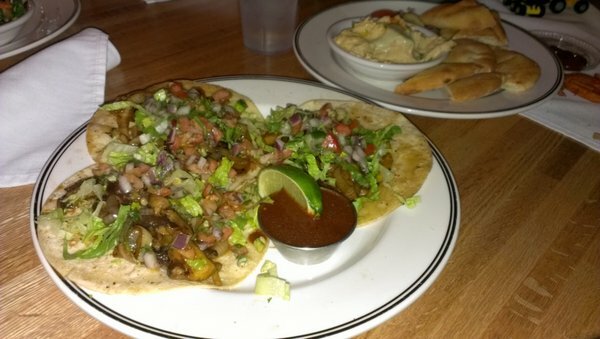 For the best mushroom ""taco" al pastor" you may ever eat, stop by Udi's for dinner and enjoy.